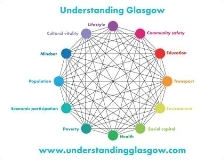 The Glasgow Indicators project has been developed by the Glasgow Centre for Population Health (GCPH) with support from a range of partners, including Glasgow City Council, Community Safety Glasgow, Glasgow Life, NHS Greater Glasgow and Clyde and the International Futures Forum. The impetus for the work has come from a number of places. Glasgow's City Strategy Action plan (2007) included a commitment to developing health and well-being indicators for the city. In 2009, Growing a Healthier Glasgow - the report of Glasgow's Health Commission - made 20 recommendations for what needed to change for the city to have a healthier future. The creation of a set of health and well-being or 'progress' indicators is one way in which the effectiveness of the Health Commission's recommendations can be monitored. The aim of the website is to create an accessible resource that will inform a wide audience about the wellbeing of Glasgow's population across a range of domains (e.g. health, poverty, education, environment), allow progress to be monitored and to encourage civic engagement in the cross-cutting issues that face the city. A 12 domain model has been developed to describe health and wellbeing in the city. This stems from the aim of creating a basket of indicators for Glasgow rather than one index, reflecting a dynamic interlinked view of the city.